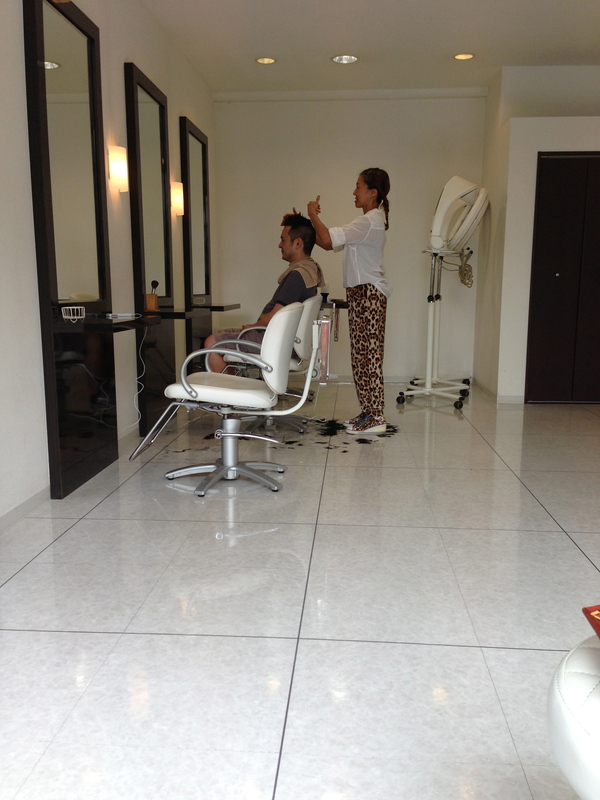 Hisae scheduled a haircut for Naoto and I while we were in Tokyo. 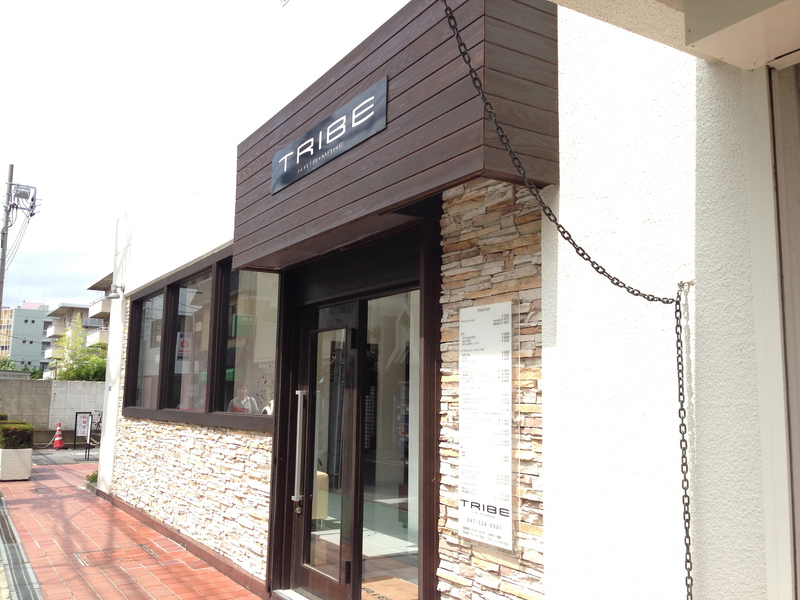 She took us to her place in the Ichikawa, Chiba (just outside of Tokyo) to meet Mika at Tribe. I’ll admit, I was a little bit nervous about the whole thing. My hair has a very different texture than Japanese hair, and I was nervous about getting a try-hard Japanophile haircut that looked ridiculous on my Midwestern white-girl face. I shouldn’t have been so worried. Mika was fabulous. She speaks English so I was able to tell her what I wanted without having to rely on Naoto to translate. She is a surfer–the tannest person I saw in Japan–and she plays a Hawaiian radio station in her salon. Nothing gives a place a more relaxing vibe that Hawaiian music! Plus, who else would look so cute in leopard-print wedge sneakers and leopard-print pants?! Getting a haircut in Japan was much like it is here. A conversation, a wash, a cut, a blow-out and styling. Mika’s assistant washed my hair. There was a wonderfully relaxing head massage during the wash, and a very hot towel was placed on my head for a few minutes. It was so calming and dreamy. After the wash, Mika started cutting. 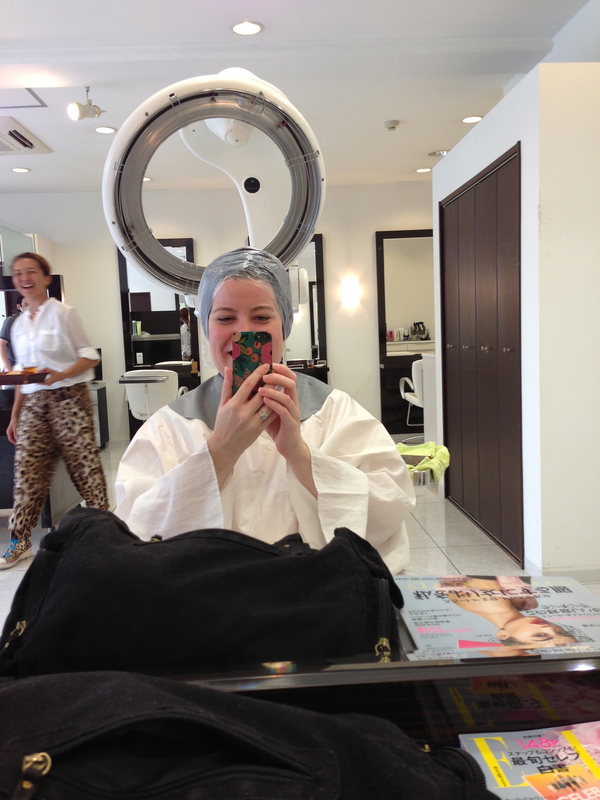 Once she was done with the initial cut, she put something on my hair and wrapped my head in a plastic bag. Then she rolled over this big donut contraption and plugged it in. The donut swirled around my head, warming the conditioning treatment on my hair. While the donut was working its magic, Mika brought me a cup of tea and a piece of miso cake. Treats should always be a part of haircuts! After the donut, Mika’s assistant dried my hair,Mika gave it a few more texturizing cuts and then she styled it with hot rollers. (Does anyone still use hot rollers? 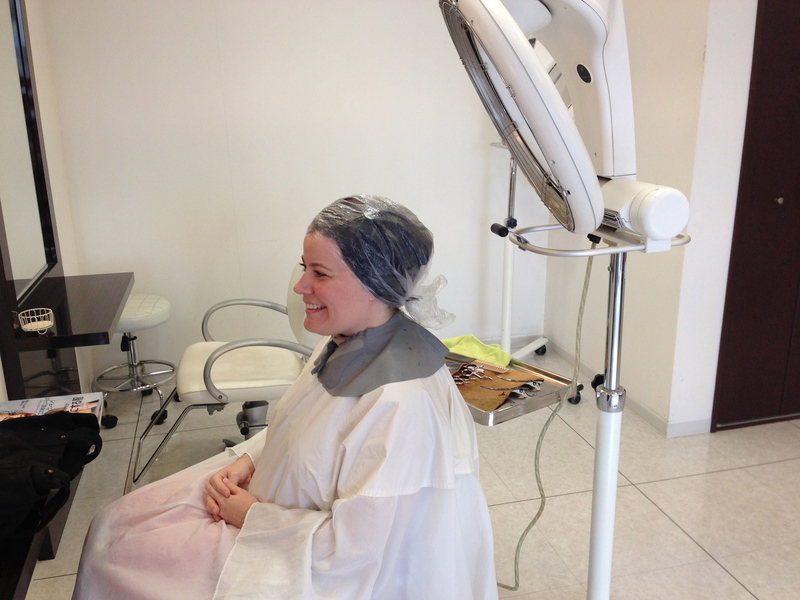 I am amazing at how quickly they worked to give my hair a little oomph! I just might be a convert!) Tribe was quite a train ride away, but it was totally worth it. Winter is almost upon us. I am the first person to pull out her winter coat in the fall and the last one to put it away in the spring. (And my winter coat is one of those big, puffy longs ones…so I look pretty ridiculous walking around in it as early as September.) I hate being cold. And I hate being dry. Dry skin creeps me out and dry air in the house makes me crazy. I feel terrible when I try to pet Presley and I shock her! For the next six months, I will be fighting a (losing) battle against chills and dryness. This summer I started using Trader Joe’s Coconut Body Butter. It is thick and rich and creamy and it smells like summer. I am determined to stay protected from dry, crackly skin while pretending to be on a beach in Hawaii. I used to think body butters were oily, but this one isn’t. (Or maybe my skin is just getting older more absorbent??) It’s perfect for daily use all over and it makes my nails and cuticles happy, too! Do you have a winter beauty routine? Any products you love and can’t live without? 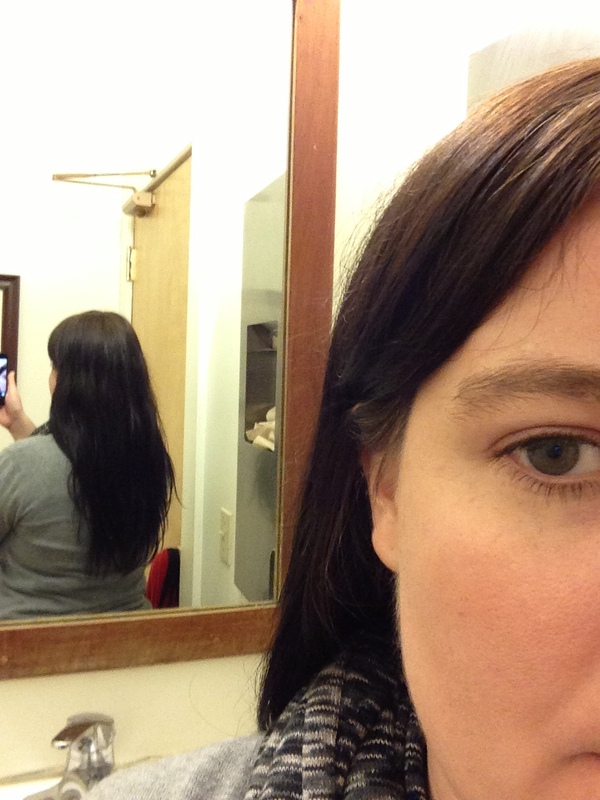 Last week I made a hair appointment on a whim, thinking I would just get the usual inch or two cut off again. My hair has been really long for a really long time. But instead of doing fun things with it, I usually kept it knotted up, or in a pony tail. Totally boring. And, even though I always had good intentions of learning fun long hair styles, I didn’t have the patience to keep practicing. I rarely braided it or put it in a sock bun…never anything really wild and crazy (except for the occasional fish bone braid, which I love!). And, I hardly ever wore it down because it just got in the way, or got all tangled and I just looked unkempt. So, lately I’ve been feeling the why-bother-with-long-hair thing. Fall felt like the perfect time to chop it all off, because it would grow again to pony-tail length in time for summer (in case I decide that I miss the pony tail thing). 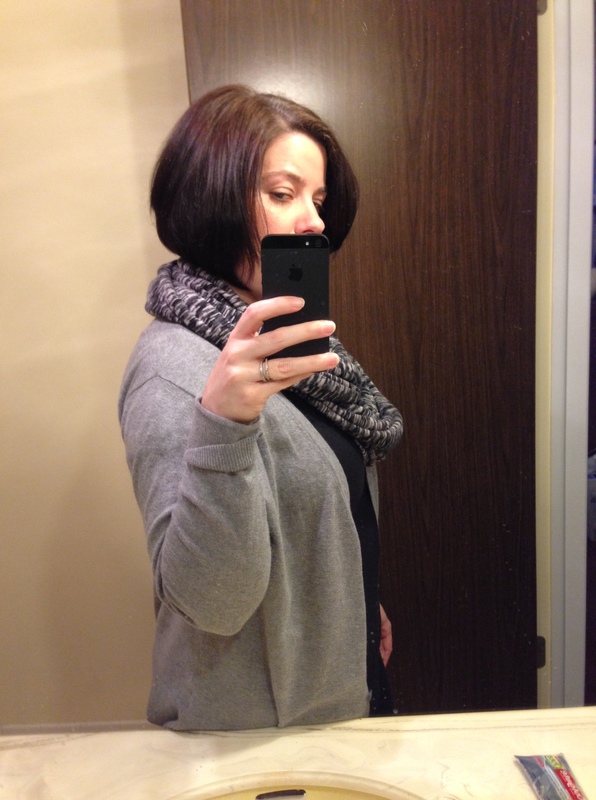 So I chopped it off–rather, my stylist, Beata chopped it off…literally. 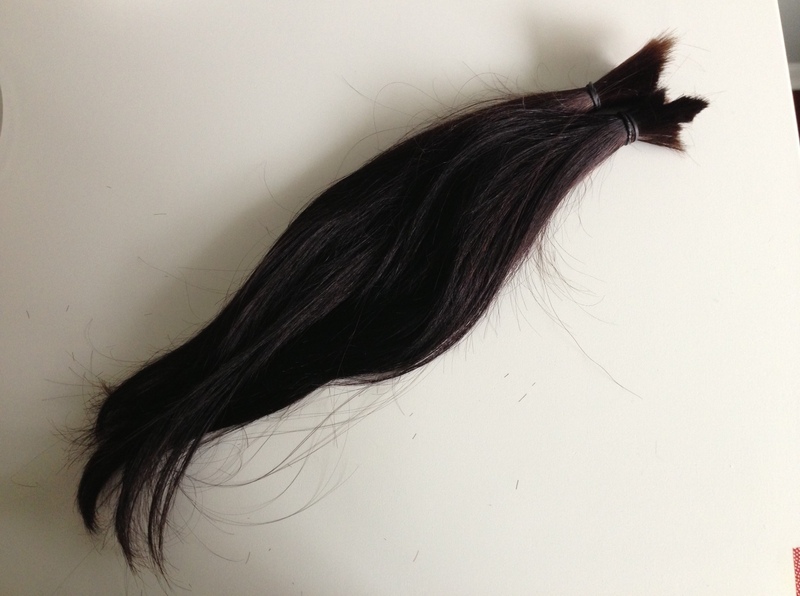 Here are the twelve inches of hair, all ready to donate to Locks of Love. It’s the second time I’ve donated hair to them…at least someone might be able to benefit from my laziness about getting haircuts! And here’s me…a little lighter in the hair department.